« Welcome to Oklahoma’s new State CTE Director Dr. Marcie Mack! In the past few weeks, a number of studies have been released focusing on jobs and careers.Â Below is a quick rundown of some of the most salient reports. This joint report, building on the collaborationÂ across these agencies to better align career pathways initiatives and efforts, details the potential employment opportunities throughout the transportation industry, broken down by subsectors, occupations, career areas and geography. A core finding is that transportation industry employers are expected to hire and train roughly 4.6 million workers, an equivalent of 1.2 times the current workforce, to meet the needs of growth, retirement and turnover in the next decade. Jobs for the Future has released a series of three briefs to support ways in which education, employers and workforce development can better collaborate to combat the chronic high unemployment of our youngest adults. They releasedÂ case studies on an EMT Career Pathway program in New Jersey; automotive and manufacturing Career Pathways in Wisconsin and Virginia; and a multi-disciplinary career exploration program in Milwaukee, Wisconsin, each of which detail the specific actions taken by employers and workforce development leaders. Typically are full-time (86%), offer health insurance (68%), and provide an employer-sponsored retirement plan (61 percent). The report finds that 2.9 million of the 6.6 million jobs added over the Recovery are â€œgood jobs,â€ most of whichÂ require at least a bachelorâ€™s degree. 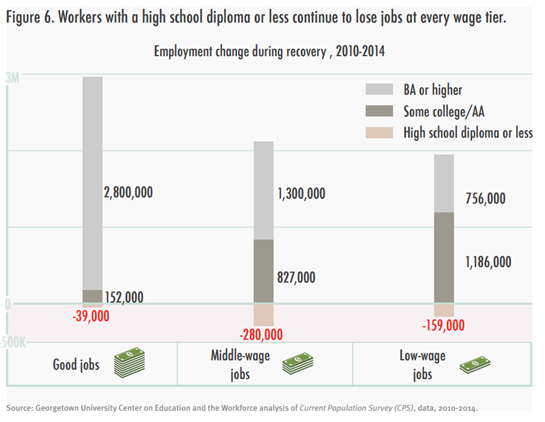 Consistent with many of the Center’s other reports, “Good Jobs Are Back” finds thatÂ individuals with a high school diploma or less as the most likely to suffer during and beyond the Recession and Recovery. Focusing on careers that will provide millennials with the greatest opportunities, Young Invincibles analyzed Bureau of Labor Statistics data using three criteria: projected occupation growth by 2022, median wage and â€œMillennial share,â€ or the percentage of the total jobs in that occupation held by young adults aged 18-34. Based on the criteria and a ranking system, the report found that physician assistants, actuaries, statisticians, biomedical engineers and computer and information research scientists were the five best jobs out there for young adults. Across the list of the 25 best jobs identified, over half are â€œSTEMâ€ and nearly all require some education and training beyond high school, a number of which require less than a four-year degree. This entry was posted on Thursday, August 27th, 2015 at 2:34 pm	and is filed under Research, Uncategorized. You can follow any responses to this entry through the RSS 2.0 feed. Both comments and pings are currently closed.